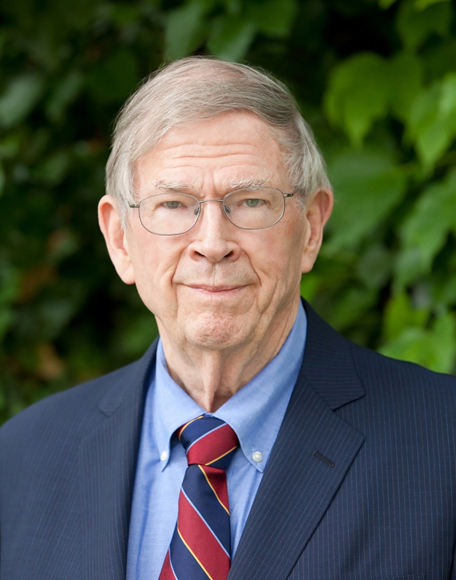 BOSTON—Harvard Business School (HBS) Dean Emeritus John H. McArthur (MBA 1959, DBA 1963) will receive the prestigious 2016 Harvard Medal during the University’s Commencement exercises tomorrow. Presented by the Harvard Alumni Association (HAA), the Harvard Medal recognizes extraordinary service to the University, ranging across diverse aspects of University life—from teaching, leadership, and innovation to fundraising, administration, and volunteerism. The Medal was first awarded in 1981, and will be presented by Drew Gilpin Faust, president of Harvard University and Lincoln Professor of History, to McArthur and three other recipients. McArthur, the George Fisher Baker Professor of Business Administration, Emeritus, at HBS, served as Dean of the School’s faculty from 1980 to 1995. He joined the HBS faculty in 1962, teaching courses in corporate finance and related fields in several HBS program while engaging in research and course development throughout Europe and North America. In 1973, he was appointed the Sylvan C. Coleman Professor of Financial Management and was named to the Baker professorship in 1980, when he became Dean. He is currently chair of the Asia Pacific Foundation of Canada, an honorary chair of the Harvard Business School campaign, and a member of the HBS Social Enterprise Initiative Advisory Board. McArthur’s service to Harvard has extended well beyond HBS, including membership on the Board of Overseers of Harvard Medical School (HMS) and on the Dean’s Councils of the Harvard T.H. Chan School of Public Health and the Harvard Graduate School of Education as well as the Harvard Clubs of Boston and New York City. He is the recipient honorary degrees from universities in this country, Canada, and Spain. He received the Harvard Statesman Award from the HBS Club of New York and a Canadian Business Leadership Award from the combined HBS Clubs of Canada. In 2013, the Governor-General of Canada appointed him an Officer of the Order of Canada. McArthur was also a founding co-chair of the board of trustees of Partners HealthCare System, which brought together two leading Harvard Medical School-affiliated teaching hospitals, Brigham and Women’s Hospital (BWH) and Massachusetts General Hospital. BWH later honored his legacy by establishing the John McArthur Program for Medicine Leadership Track, which enables residents to earn their MBA from HBS during their residency at the hospital. The John and Natty McArthur University Professorship was established at Harvard in 1997 in honor of McArthur and his wife, while McArthur Hall, a residence hall for HBS Executive Education participants, was dedicated in 1999. A group of Canadian alumni announced the creation of the John H. McArthur Canadian Fellowship program in 2002. A native of Vancouver, British Columbia, McArthur earned a bachelor of commerce degree in forestry from the University of British Columbia in 1957 before completing his MBA degree in 1959 and his doctorate in business administration in 1963 at HBS.